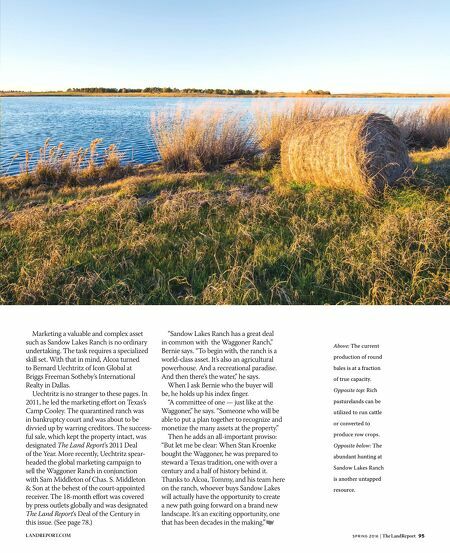 S P R I N G 2 0 1 6 | The LandReport 95 LANDREPORT.COM Marketing a valuable and complex asset such as Sandow Lakes Ranch is no ordinary undertaking. The task requires a specialized skill set. With that in mind, Alcoa turned to Bernard Uechtritz of Icon Global at Briggs Freeman Sotheby's International Realty in Dallas. Uechtritz is no stranger to these pages. In 2011, he led the marketing effort on Texas's Camp Cooley. The quarantined ranch was in bankruptcy court and was about to be divvied up by warring creditors. The success- ful sale, which kept the property intact, was designated The Land Report's 2011 Deal of the Year. More recently, Uechtritz spear- headed the global marketing campaign to sell the Waggoner Ranch in conjunction with Sam Middleton of Chas. S. Middleton & Son at the behest of the court-appointed receiver. 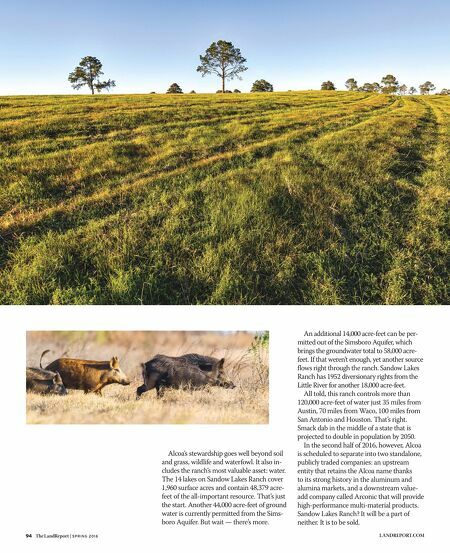 The 18-month effort was covered by press outlets globally and was designated The Land Report's Deal of the Century in this issue. (See page 78.) "Sandow Lakes Ranch has a great deal in common with the Waggoner Ranch," Bernie says. "To begin with, the ranch is a world-class asset. It's also an agricultural powerhouse. And a recreational paradise. And then there's the water," he says. When I ask Bernie who the buyer will be, he holds up his index finger. "A committee of one — just like at the Waggoner," he says. "Someone who will be able to put a plan together to recognize and monetize the many assets at the property." Then he adds an all-important proviso: "But let me be clear: When Stan Kroenke bought the Waggoner, he was prepared to steward a Texas tradition, one with over a century and a half of history behind it. Thanks to Alcoa, Tommy, and his team here on the ranch, whoever buys Sandow Lakes will actually have the opportunity to create a new path going forward on a brand new landscape. It's an exciting opportunity, one that has been decades in the making." Above: The current production of round bales is at a fraction of true capacity. Opposite top: Rich pasturelands can be utilized to run cattle or converted to produce row crops. Opposite below: The abundant hunting at Sandow Lakes Ranch is another untapped resource.